First, it was found in Danish waters. And then France. Then in New Jersey. A fish, normally found in the Amazon, was scaring the pants ON fishermen around the world. Why be scared of a pacu? Teeth and what it was rumored to eat. It has teeth resembling humans'. It is often associated with its horrifying family relation, the piranha. The pacu is the common name given to several species of omnivorous freshwater fish of South America. They are frequently sold for aquariums. When they get too large or unwanted, they are illegally released into the local waters. They were also big news this past summer. Sensationalism, pure and simple. Competes with a great white shark for terror? HARDLY. It's only twelve inches (or so) long! It's related to the piranha but it doesn't devour people. It doesn't even eat meat regularly. The photo used in this article appears to be a sheepshead (fish), not pacu. So much for fact checking. Maybe it was just a good story, but I suspect it was the image of a toothy mouth and the idea that the animal goes for the crotch that caused the media to take the bait on this story. When I covered it for Doubtful News, it sounded fishy. 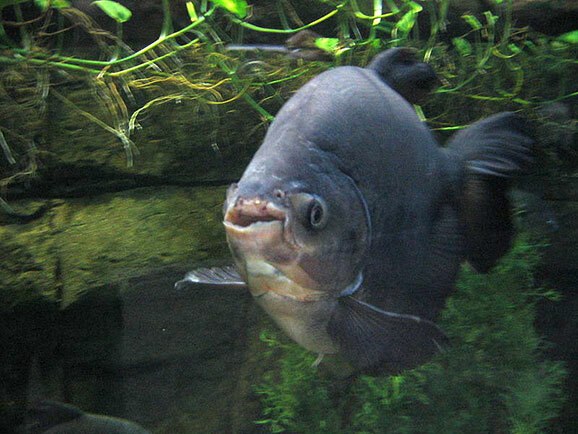 In short order I found there was no evidence for the claims that pacu were anything to fear. Disturbingly, I found that certain scientists who were sought out for information by journalists promoted unnecessary fear by being a bit cheeky. The pacu Wikipedia page has information on a child being bitten on the finger by an aquarium-kept pacu but no other reports of human incidents. Their scary teeth can deliver a nasty crushing bite because they are equipped to eat hard foods like tree nuts. It was irresponsible for these professors, who the media looks to for expertise and facts, to extrapolate that the fish could be a threat to human parts. Other fish in lakes and rivers have teeth and occasionally chomp on people, too. Should we get all nervous about them too? Sheepshead are fish that are native to the U.S. with a very scary dentition, even worse than pacus but we don't seem to get too worked up about that. 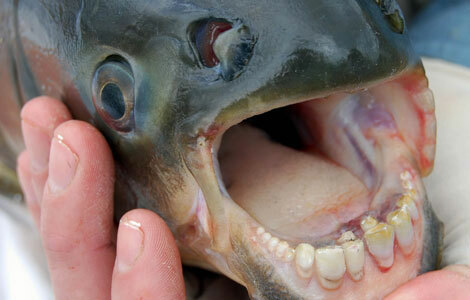 As noted above, some photos of pacu mouths appear to be sheepshead instead. It is also worth considering how often men actually swim naked in these well-populated areas? It's POSSIBLE that those natives who regularly fish in the pacu's Amazon environment may have had a few incidents (as I said, there is no readily available documentation of it), but that is completely different that the situation of the pacu found in non-native waters. They are tropical fish, and while fairly adaptable it seems, they will die in post-summer cooling or freezing waters. Only one specimen was reported in each of these places, not several. Nor is there any reason to believe many of them were in the waters. It is unlikely that they can reproduce because the northern water conditions are not conducive to mating. The previous unsubstantiated rumormongering provided a foundation to spread the nonsense stories about this fish again. When a specimen was caught in New Jersey, the same ludicrous legend was attached. Really, people! The N.J. fish was only 10 inches long. Ooh, scary. Don't put it down your pants and you should be okay. The pacu has been found in loads of other states and non-native locations. It's rather common to find it where it isn't supposed to be. There are serious things to worry about. A pacu invasion is NOT one of them. Rotten tomatoes are metaphorically to be pitched at the media who ran with the sensationalism. Finally, a note to scientists: don't assume the journalist will get your humor. Be aware of things you say, because many people will swallow it hook, line, and sinker.